If any of you hockey fans watch the Edmonton Oilers vs. Vancouver Canucks game on Saturday February 16, 2008; then maybe you can help me with this. What was going on?? There was a fight that almost started instantly in the first period!? Did something happen in a previous game that I might of missed?? or do these two teams truly hate each other?? And the thing was, it just wasn’t a fight here and there, they basically took up the whole game!! At the end of the third, the Refs started throwing players out of the game…granted there was only 5 – minutes left, but still!! I think my favorite part was when there were 6-7 people serving a penalty at the same time!! 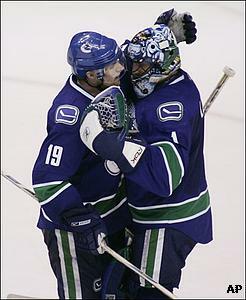 And then when the Canucks player, Daniel Sedin, ran into the Oilers goalie, Mathieu Garon….that just sealed the deal. You just don’t mess with another teams goalie. 193 minutes served in total for the whole game in penalties as well as 14, and that doesn’t include the players who were benched in the third or the players who were thrown out at the end of the third for fighting. It was crazy!! If you missed it you missed on an awesome game! !